Its festival times here in India with festivals like Diwali , Eid , Christmas and New Year round the corner . Gifting has been the age old tradition for people to celebrate festivals . 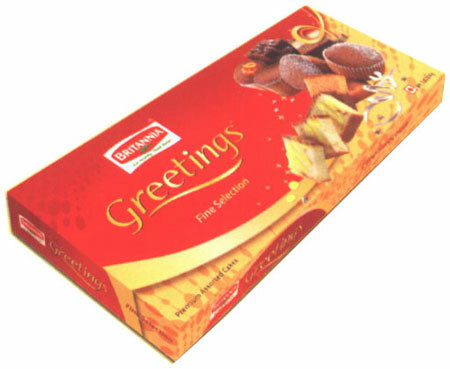 Traditional gifts such as sweets , dry fruits , imported candy and chocolates has been taken over by new categories of gift such as Snacks , Cookies , Biscuits . Markets are flooded by snazzy packs , glitzy packaging from major bakery manufacturers . Gift packs offered covered wide range of products from exotic cookies , cakes , assorted biscuits and cream biscuits making it right choice for gifting .Price range is between Rs 150/ - Rs 500/-. The popularity of such gift packs can be judged by the number of gift packs available in the market, earlier we used have one or two brands during deepavali but we have atleast dozen of brands eyeing for the share in gifting category in this season.Also due to news highlighting floods of adulterated sweets being sold during Diwali have made consumers looking out for healthy and safe food products .Interestingly even small bakeries have joined this Gift pack business with their niche products such as wafers and cookies . Gift Pack business has become significant contributor to companies bottom line as these packs are sold on premium . Frontier Biscuits -Eggless cookies . Gifts are symbol of our feelings & affection of particular person. We are love our mother, father, brothers, sisters, friends and our partner. But we can't express always. We gift to some particular person for some special occasions like his/her birthday, that will reflect our love. Chocolate and Ice creams are the best gift for any festival and celebration the best part of such gifts is that they are loved by every age group.